The decisive role that Norwegian folk music played for Edvard Grieg can be felt in almost all of his works. The Norwegian Dances op.35 of 1880, presented here in an Urtext edition, are arrangements for piano four hands of old folk tunes that Grieg took from a collection published by the musician and researcher Ludvig Mathias Lindeman. 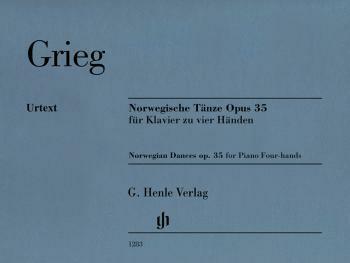 For this Henle Urtext edition, all the extant autographs in the Grieg Archive in Bergen, Norway were consulted along with the contemporary first editions. The co-editor here is the Norwegian pianist and Grieg specialist Einar Steen-Nøkleberg, who is also responsible for the fingerings.